Kids love this easy treat! 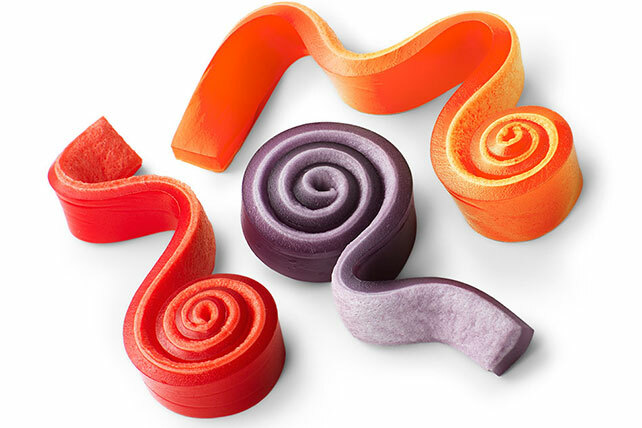 A mixture of marshmallows melted in flavored gelatin is chilled in a pan, then rolled up and sliced into wiggly pinwheels. Stir gelatin mix and water in medium microwaveable bowl. Microwave on HIGH 1-1/2 min. ; stir until gelatin is completely dissolved. Stir in marshmallows. Microwave on HIGH 1 min. or until marshmallows are partially melted. Stir with whisk until marshmallows are completely melted. Pour into 8-inch square pan sprayed with cooking spray. Refrigerate 45 min. or until set. Run sharp knife around edges of pan to loosen gelatin layer from pan. Starting at 1 edge, roll up gelatin layer tightly. Cut into 1/2-inch slices. Refrigerate, covered, until ready to serve. These pinwheels are sure to be a hit with kids. They are easy to make and a serving, 2 pinwheels, makes a nice sweet treat for kids. Substitute 12 JET-PUFFED Marshmallows for the miniature marshmallows. Prepare as directed, but do not roll up. Cut into shapes with metal cookie cutters. Prepare gelatin mixture as directed, doubling all ingredients. Pour into 13x9-inch pan. Refrigerate as directed. For ease in handling, cut gelatin mixture in half crosswise before rolling up. Roll each half separately to form 2 rolls. Cut as directed. Prepare recipe as directed. After refrigerating, repeat recipe in same pan with another gelatin flavor. Cool second flavor gelatin to room temperature before pouring into pan. Refrigerate as directed. Cut into shapes as desired. JELL-O Marshmallow JIGGLERS: Prepare recipe as directed, but do not roll up. Cut into shapes with metal cookie cutters. Two-Color JIGGLERS: Prepare recipe as directed. After refrigerating, repeat recipe in same pan with another gelatin flavor. Cool second flavor gelatin to room temperature before pouring into pan. Refrigerate as directed. Cut into shapes as desired. Check out our Lemon-Marshmallow Pinwheels recipe.